The story of Coirier à Clermont is a interweaved tale of partnerships and encounters that begins in 1848. 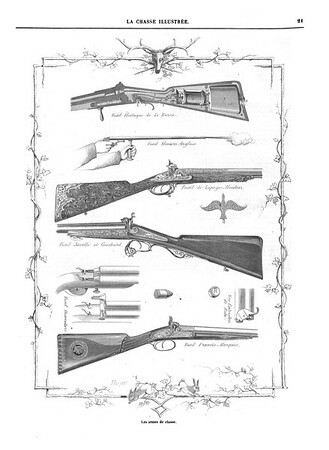 In 1848 a Frenchman named Francis Marquis founded a company that made carbines for cavalry. In French this is the term, harquebusier. He was known for making high quality guns and displayed some of his work at the Exposition Universelle of 1855 in Paris, the 1862 Great London Exposition and the 1867 Paris Universal Exposition. You may be starting to wonder why we are talking about Marquis when this is an article on Coirier. Well, Marquis had an office at 4 Boulevard des Italiens in Paris. This was an office building that was used by various businessmen. There was a a steamer, a journalist, some company directors, etc. Importantly, there was also a man named Coirier, who was listed as a propriétaire. I do not know if he was the propriétaire (land/building owner) of this particular property or just one in general. But at some point he made a business transaction with Marquis. 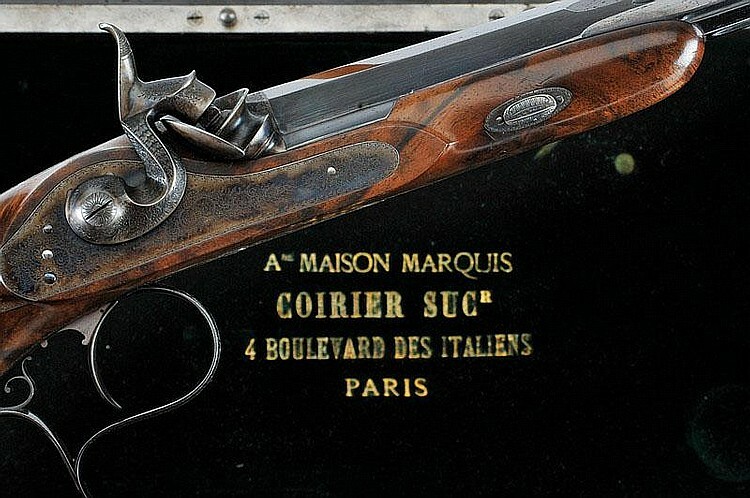 The following gun, which was sold at an auction, is marked Coirier à Clermont on the gun. The case it came in however ties this all together. 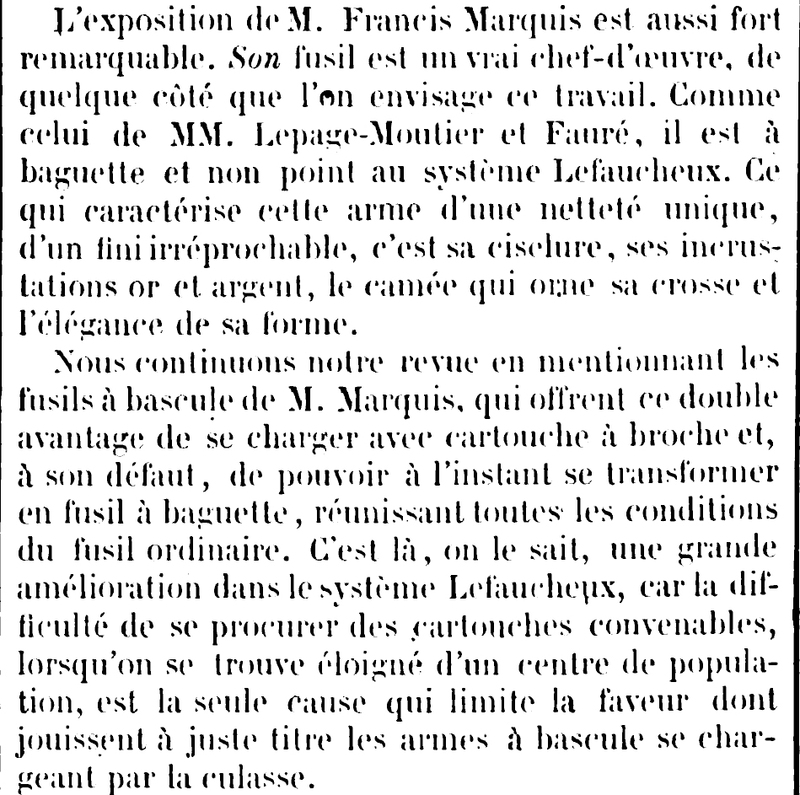 It lists Coirier as the successor of the Anciennes Maison (“old house”) Marquis. 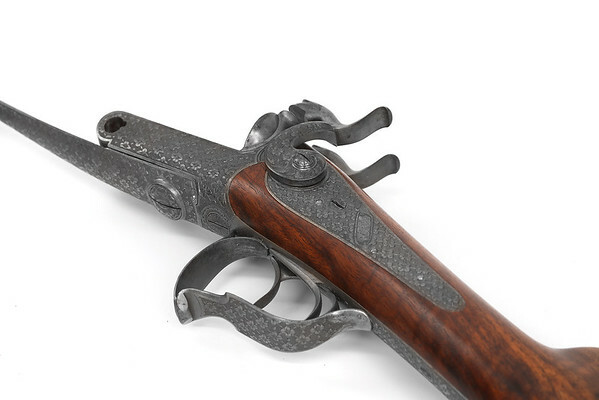 Another example of a similar gun with similar markings on the gun and case was sold at a Christie’s auction in 2000. The following invoice from 1894 makes our story even more confusing. 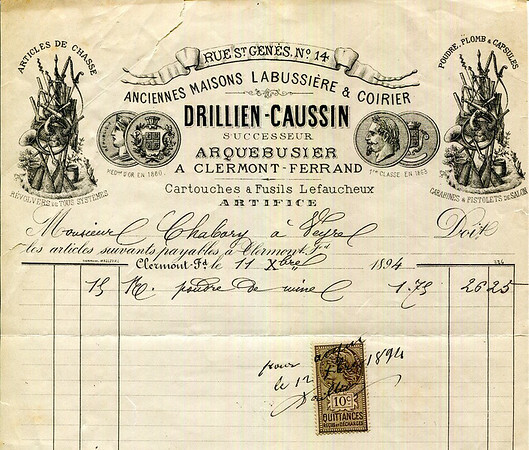 It is an invoice by Drillien-Causin of Clermont which is listed as a seller of Lefaucheux cartridges and guns. They are listed as the successor of Labussière & Coirier. 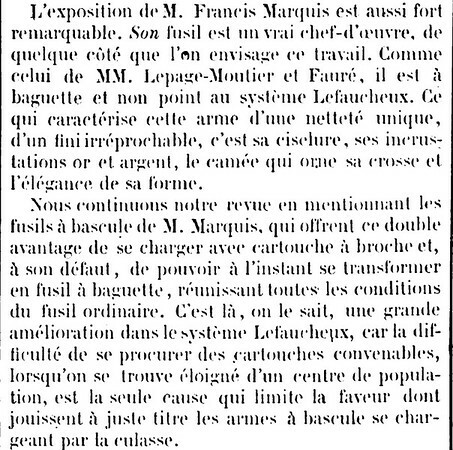 Interestingly, there was a Coirier (partnered with a Gaguet) and a Labussière who displayed at the 1867 Paris Universal Exposition. However they were both winemakers. Also, a Claude Jean Baptiste Coirier took out a French patent in 1865 for a cartridge crimper. So maybe all of these partnerships and encounters all weave together to tell a single story or maybe there are just a lot of coincidences. 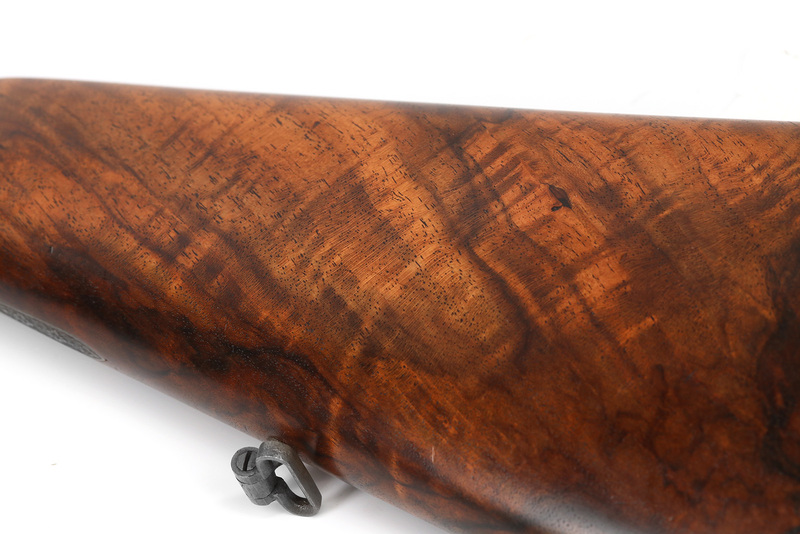 Either way this gun that was retailed by Coirier à Clermont is one of the highest quality pinfire shotguns I have come across. 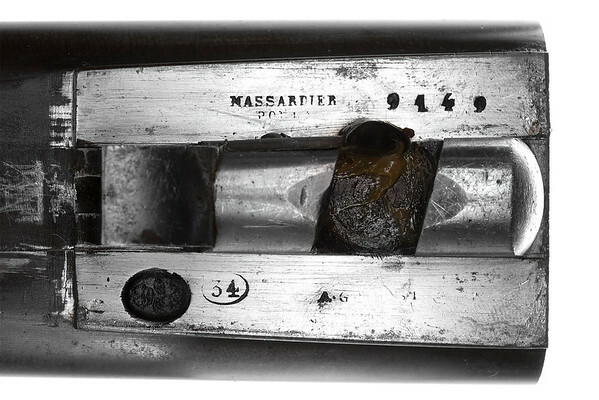 The barrel was made by award winning, Massardier-Poulat of Saint Étienne, France. Maybe the rest of the gun was as well. He won awards at the 1867 Paris exposition that everyone in this story seemed to display at. It is proofed in Saint Étienne, France and is marked as being 34 bore. This 34 is based on the old French Pound (Livre.) 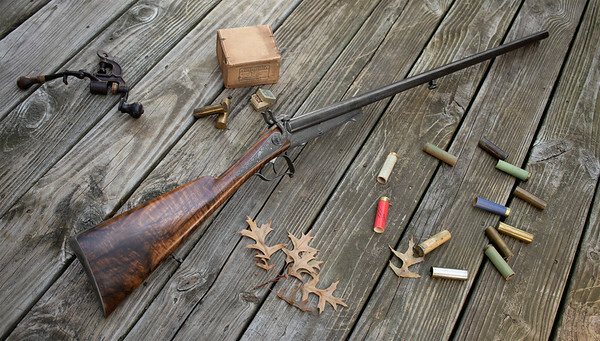 It is essentially a 16g pinfire shotgun. Based on the proof marks it was made between 1856 and 1868. Based on the information we could find on the various retailers, it most likely dates closer to 1868 than 1856.